» How Does A Wetroom Work? A wetroom is a bathroom with a shower area at the same level as the rest of the floor. A wetroom’s unique design allows it to answer a number of challenges faced in modern building design. Wetrooms are stylish, functional and low maintenance. They elegantly create an attractive space that meets accessible room standards and uses bathroom space wisely. A wetroom’s minimalist design adds an extra element of wow factor to any building, in a style that is contemporary with clean lines. 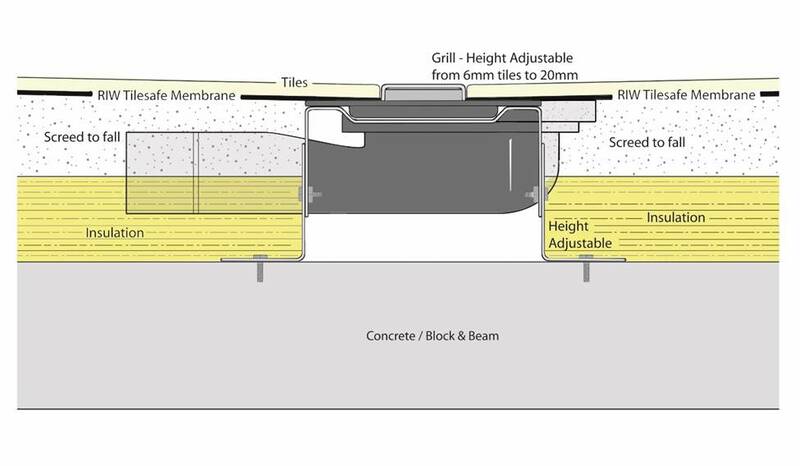 Designing a wetroom can be broken down into 3 cores areas that include the most critical elements of consideration: gradient, drainage and waterproofing. The first consideration when designing a wetroom is to determine whether it is being built on a solid floor or the timber floor of an upper storey. Depending on which kind of floor will determine how the wetroom will be designed. For a solid floor, screed is used to create the all-important gradient that will allow water to flow to the drain without pooling. Alternatively, hi-build latex topped with a tapered board can be used to create a smooth fall to the drain. For wooden floors, the floorboards are removed in the shower area and batons are fixed to the joists to support a base of plywood. 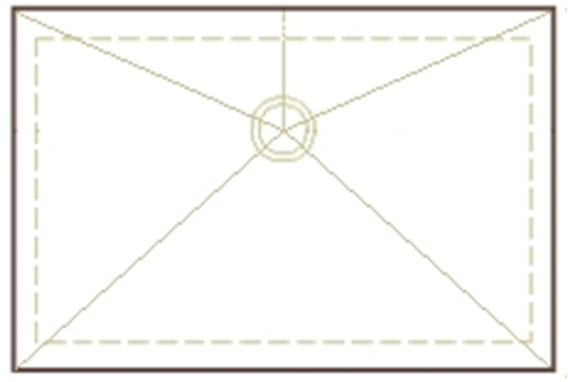 This creates a level surface for the floor former (also known as a dec) to sit on. 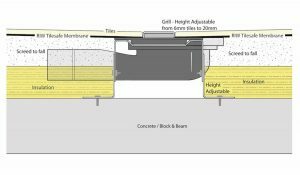 A dec is a 22mm pre-formed shower base that matches the depth of the bathroom floorboards to create a guaranteed consistent gradient towards the drain. A consistent gradient is essential for a wetroom because it keeps water flowing towards the drain and prevents it from pooling. Pooling water can cause a slip hazard to users and could escape the waterproof area, which in time may cause long term damage. At CCL Wetrooms, we recommend using a self-adhesive membrane for the floor. Whether you’re installing on a wooden floor or a solid floor, the next area of consideration is waterproofing. Consideration should be given to the type of waterproofing or ‘tanking’ that is used, as well as the area that is to be waterproofed. 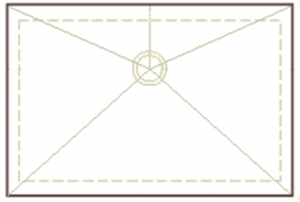 Tanking involves covering the proposed area in a water proof membrane. This can be achieved in two ways by using either a liquid, paint-on membrane or a self-adhesive sheet membrane that can be cut to shape. Self-adhesive sheet membranes are very easy to apply and provide a consistent thickness across the entire space. 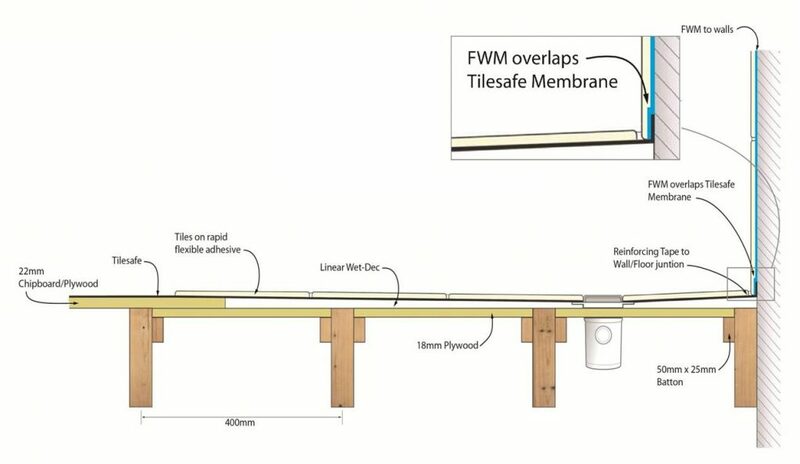 Once the membrane has been applied, tiling can commence straight away, allowing for productive use of time on site. 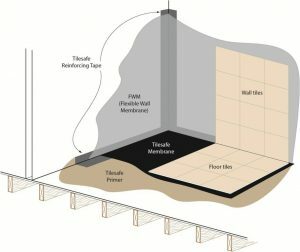 When applying a waterproof membrane, the area to be covered is determined by the floor construction. For timber floors above the ground floor, it is recommended to tank the entire area. For a ground floor wetroom on a solid floor, the shower area plus an area of 1m around the shower is sufficient. Wall and floor junctions are critical areas for wetrooms, so the best practice is a “belt and braces” approach. Reinforcing tape, combined with liquid membrane overlapping with the self-adhesive membrane, create a totally waterproof seal, as you can see from the diagram below.If you are tanking a steam room, the ceiling should also be waterproofed in the same way as the walls due to the potential for rising water vapour. There are several types of tiles and drainage options available when designing a wetroom. Mosaic tiles present a variety of creative options for wetroom floor patterns, while large format tiles help reflect a wetroom’s natural minimalist and expansive feel. Depending on the fall of your wetroom floor, your tiles must be very carefully considered and arranged to get the best results. If you have a four way fall, mosaic tiles work well in presenting a smooth and gradual fall along four angles. Large format tiles can leave long grout lines along the edge of the fall that can lack a certain aesthetic cleanliness. For the very best results, large format tiles are best suited to long, simple one or two way falls. When designing a wetroom, the choice of drain serves not only as an aesthetic choice, but a practical one too. Linear drains are often positioned parallel to the wall opposite the entrance to the shower. This allows water to flow safely to an area of very little foot traffic and helps reduce the overall splash zone. Traditional drains can sit directly beneath the shower head, in the centre of a four way fall. Flow rate also has an impact on your design choice. The valve and head of the shower will affect the flow rate and you will need a drain and trap that can cope with these rates. Thanks to its larger drainage area, linear drains can handle higher flow rates more effectively than traditional drains. Flow rates can be further increased by the addition of up to three traps positioned along the length of the linear drainage area. If you don’t need three traps, the length of a linear drain allows traps to be placed out of the way of joists and other obstacles beneath the floor. 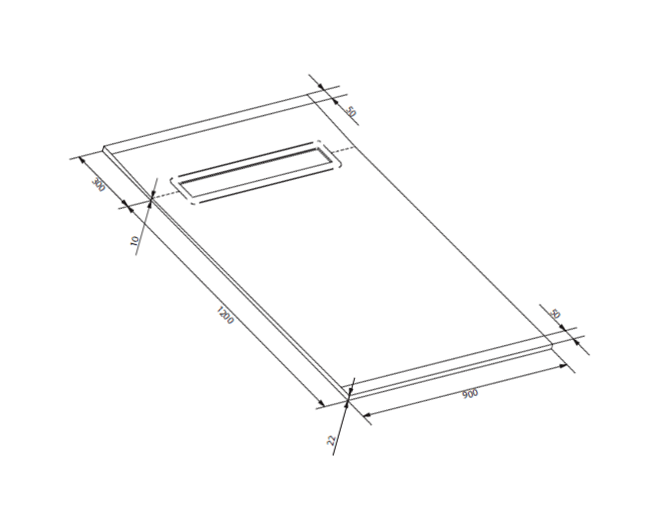 This ultimately gives you greater design flexibility all round. 70% of water used in a shower, falls within 600mm of the shower head. This fact is the key consideration when considering your splash area. Effective management of your splash area reduces water wastage and prevents your shower from dispersing water all over the bathroom. Spray should be directed toward the corner of the shower area and not towards the entry point. Fixed shower heads offer greater control of water direction. If your design includes body jets, give careful consideration to their position and angle to contain the water to just one area. The majority of wetrooms are installed with a straight or curved single panel, which acts as a splash screen. To emphasise the sense of openness and space, many splash screens are made from glass. Glass screens are easy to clean and provide a neat and attractive finish to a wetroom design. How Do Wetrooms Work To Your Benefit? Developers are always looking to optimise space in order to maximise the number of levels or floors into apartment blocks, hotels and other high rises. One of the most effective ways of doing this is keeping floors and build-ups as shallow as possible. Saving every inch on every floor and add up to significantly more space overall. Our wetrooms are able to create more thanks to our specially designed shallow drainage systems. 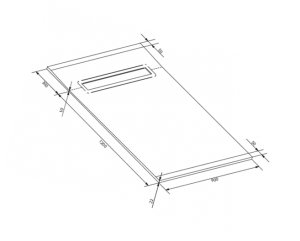 Their unique design allows the drainage system fit into the shallowest of floors, saving vital space without compromising on quality or flow rate. The absence of a shower tray in a wetroom removes a common bathroom trip hazard. Wet rooms are also easier to clean as there is less in them that can get dirty. If you combine a wetroom design with epoxy grouting and a wall hung toilet and basin, you will get the easiest possible wetroom. The amount of time spent cleaning a wetroom can have a real affect on a business’s bottom line if staff have many rooms to clean. A wetroom’s low profile allows the bathroom to meet accessible room standards for hotels and commercial builds, while embracing the principles of inclusive design – a concern for Local Authorities and commercial developers in a world with an ever-aging population. Wetrooms take up less space than traditional bathrooms, allowing you to make better use of challenging small spaces when designing properties. Walk-in showers and wetrooms are very desirable to home owners and provide a huge style boost to a bathroom. As well as potentially increasing the value of a property, a stylish and modern bathroom can be the difference between consumers choosing one property over another. Wetrooms are a cost effective and attractive option when it comes to bathroom design. For more information on how a wetroom from CCL Wetrooms could improve your development project or build, get in touch with our expert team.